The smart home device market is rapidly growing and is be driven in part by a newly emerging home service market where various cable MSOs, broadband service providers, and telcos offer a variety of new home automation and connected home services. These include home security, temperature monitoring and control, remote locking and unlocking of doors and windows, turning lights off and on, as well home health monitoring, water and gas leak monitoring, etc. Figure 1. Using ZigBee, a variety of smart home sentroller devices will not only talk to each other, but to the end users via a remote control, web interface, and/or a smartphone. 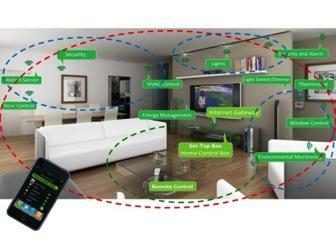 This market requires a variety of technology solutions -- sensors, controllers, and actuators -- the various devices for the Smart Home that together can be labeled as “sentrollers.” In addition, the market will require set-top boxes and/or home control boxes, the central router for all the home’s automated systems, as well as for entertainment and broadband access.